Blue Sea believes in the power of charities to make the world better. Blue Sea Foundation believes in the power of charities to make the world better and our vision is to see a more generous world where charities thrive. We ache for the suffering and need in our world, and believe that the best way to make a difference is to build your charity's fundraising and financial health. What powers our efforts is the deep desire to amplify your impact, to see your charity better funded and thriving as a force in your community. Through our portfolio of signature peer-to-peer events and new Essentials Fundraising program, we help you build buzz, momentum, and your bottom line. charities providing shelter, food, education, addiction support, and more. Want to know more? Call or email us! Blue Sea is a granting foundation... with a twist. Unlike regular foundations, we have no endowment and don't accept applications for traditional grants. Our charity partners receive grants through our Partner Grant Program, and we consider those grants to be "earned" by participation in Blue Sea events. Through approval and participation in one (or more) of our national peer-to-peer fundraising events, Canadian social service charities can earn their grant through their successful recruiting and fundraising efforts. 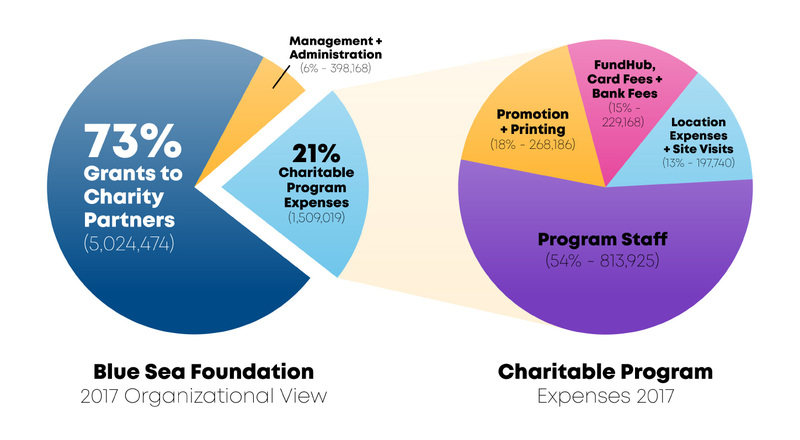 The more successful a partner charity, the larger the "earned grant." When coupled with our hands-on coaching, our peer-to-peer event fundraising campaign delivers a reliable return on investment, an engaged community of support, greater awareness, and valuable knowledge of events and fundraising. "Participating in your events is more reliable than any traditional grant application - I know if I invest the hours into my campaign, I will get the grant I want at the end." Blue Sea Philanthropy Inc. is the legal name for Blue Sea Foundation. Our financial statements have been prepared in accordance with widely-accepted Canadian accounting principles for not-for-profit organizations, as established by the Accounting Standards Board of the Canadian Institute of Chartered Accountants. You may access our CRA page and filings here. Every $1 invested in our charitable program produced $2.63 in earned grants. Blue Sea is governed by remarkable leaders and thinkers who care deeply about charities and the people they serve.